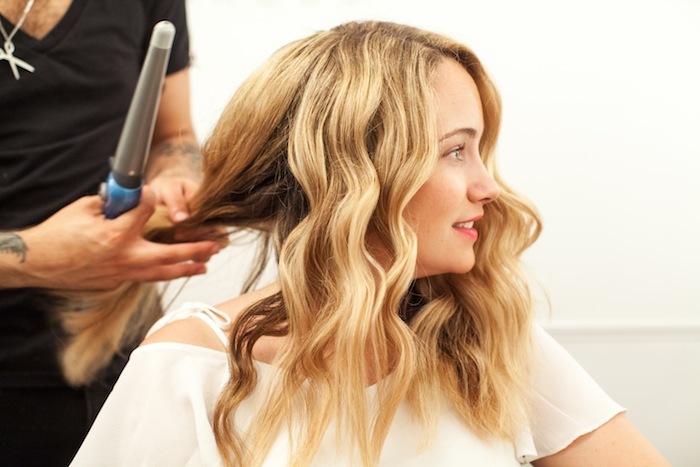 And we’re baaackkk, with a beach waves hair tutorial. In case you missed it, I’ve teamed up with my friend + stylist Jay Jackson from DreamDry to bring you a series of hair tutorials. We’re aiming for two a month, so if you have any suggestions or things you’d like to learn, please tell me in the comments! 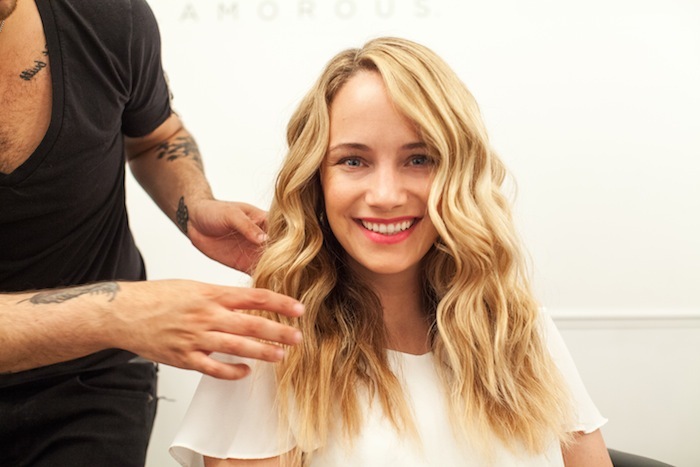 So far we’ve done a crown braid two ways + a Game of Thrones inspired braid… but today we wanted to do something a little less intimidating, so here they are: no comb beach waves! I’ve been really excited about this one as it’s the perfect look for summer, and also this is the hair from this outfit post… so many of you had commented that you liked my hair that day. 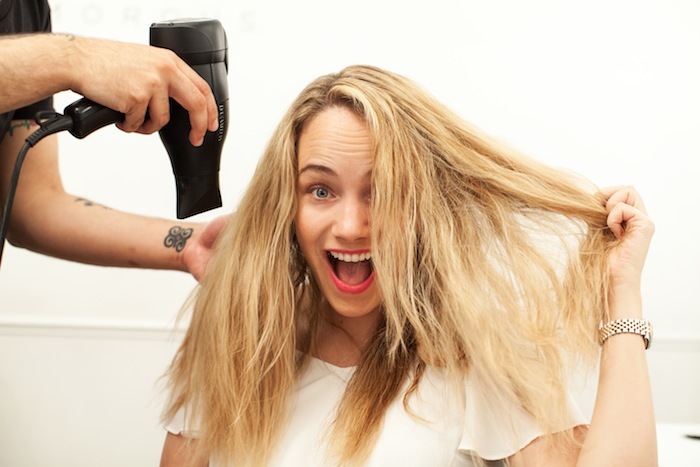 You can do this on air dried hair, or (like we did), start with wet hair and blow dry your hair with your fingers. Jay started by (as he called it), basting the hair with Foundation Mist. Foundation mist is a leave in conditioner, so you could just use your preferred leave in conditioner. 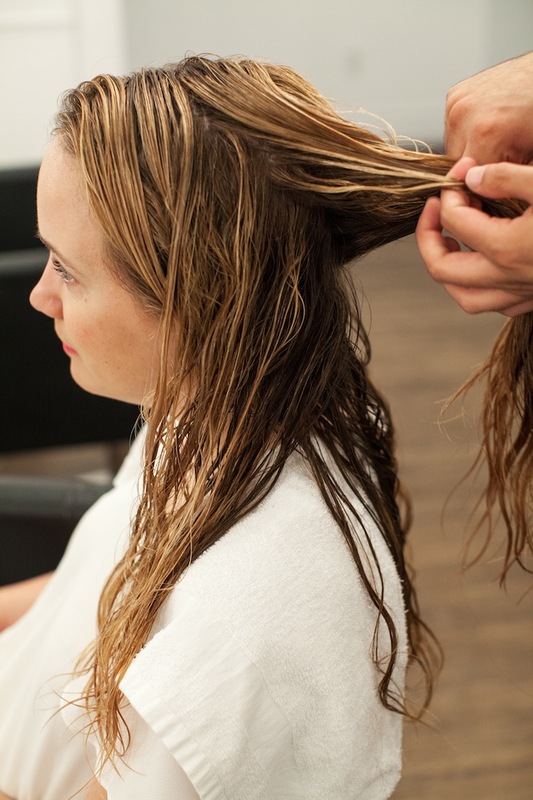 This step is important as it smooths frizz and helps to prevent + heal breakage. He divided my hair up into tiny sections to make sure every piece was covered. From there, he applied Oribe Surf Comber which is a pomade/oil texture mousse. This is how you get the beachy vibe. Jay’s gotten me hooked on this product as it’s a mousse but super hydrating… and gives your hair a nice piece-y look. It provides your hair with texture, without any crunch. He was very thorough, applying small amounts to quarter inch sections, and twirling them to get natural curls. 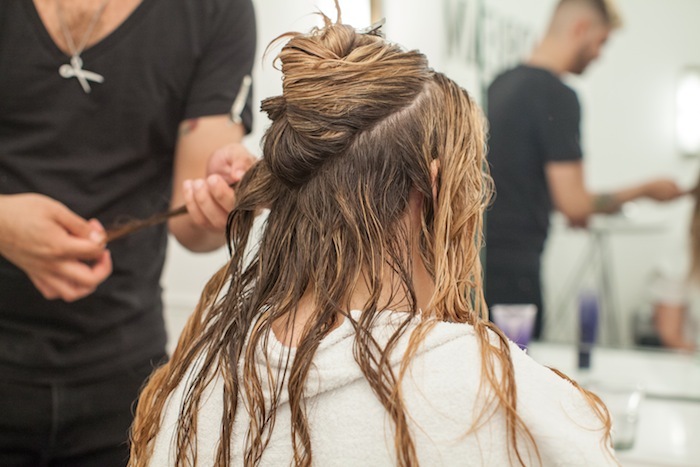 The next step is to hang your hair back (or just flip your head over) and squeeze the product into your hair. 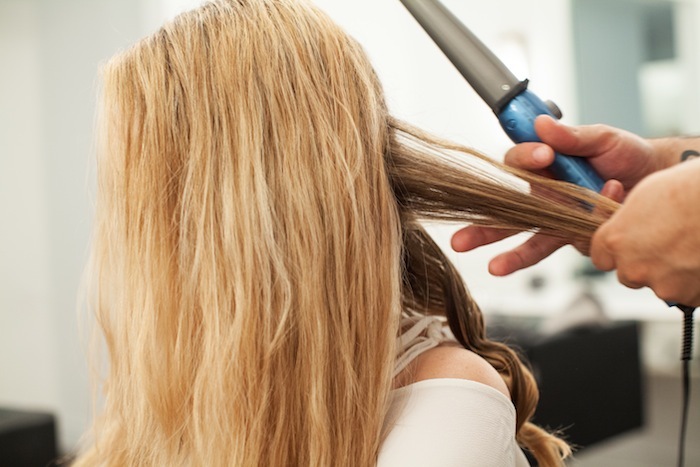 From there, blowdry (or let your hair naturally air dry). 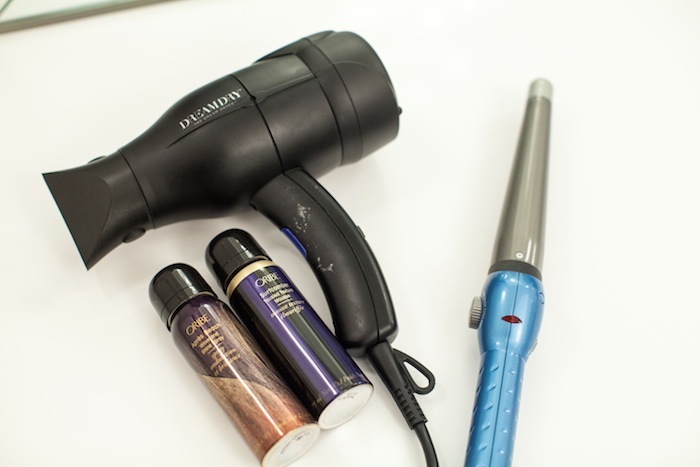 In this case you basically just let the air from the blow dryer go through your hair. 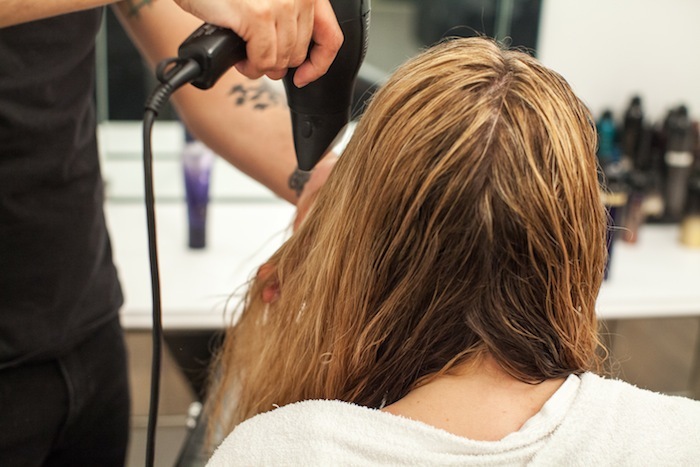 You can gently dry it with your fingers, but don’t even think about combing it or using a brush. For more volume (we didn’t do this as I do NOT need any more volume!!) flip your head upside down. See what I mean? We definitely didn’t need any more volume. Rarrrr, Lion hair. 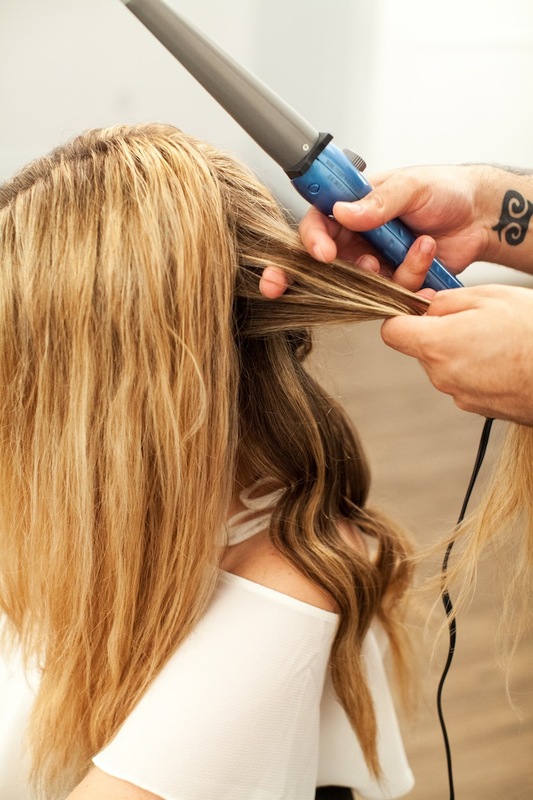 I should note that I’ve always been a little intimidated by wands (I personally like having the clamp there and when I do this at home, I use my BeachWaver – and swear by it!) But whichever route you go, the key here is to leave the ends out to give it a messy beachy vibe. No ringlets! 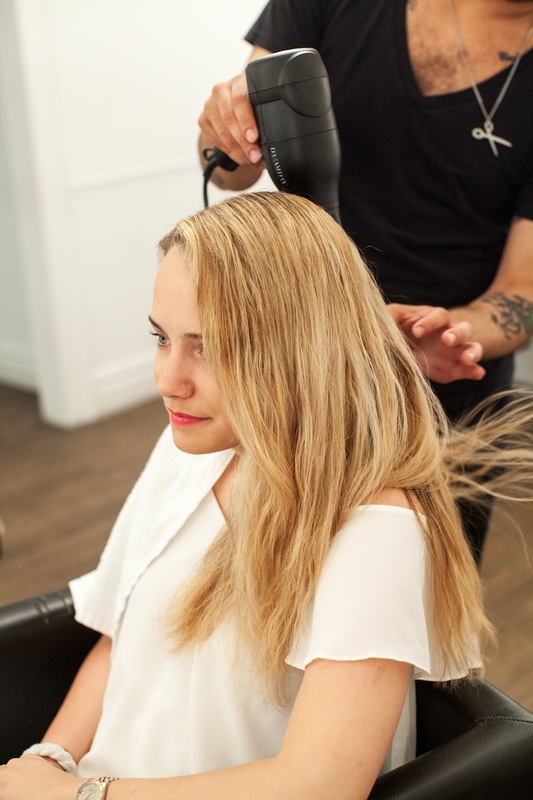 A few tips for the wand… Jay recommends touching the hair (as demonstrated above) to make sure it isn’t getting too hot… and said that the key is that you never want hair to be flat on the wand… it should always be a cylinder! 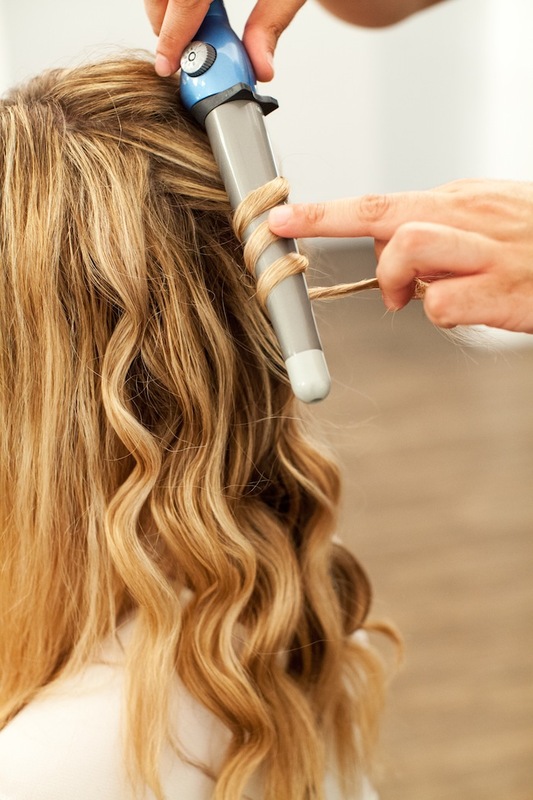 Lastly, something I never knew: when wanding your hair, you always point the tapered end down. Once you’ve completed curling (or wanding!) gently brush out the waves with your fingers. I noticed that for any frizzy sections, Jay would just pull that part of the hair tightly and rub the wand against it to smooth it out. Pretty clever. Last but not lease, he finished up with Oribe “Apres Beach” Hair Spray. 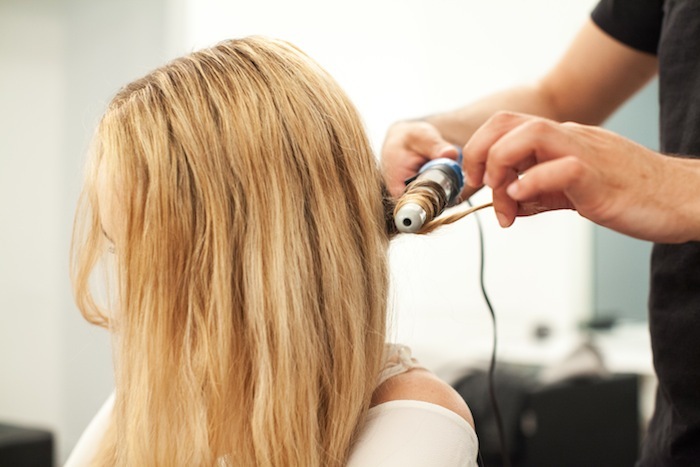 He noted that it’s important to spray in a downward direction to help seal in the curl and prevent any flyaways or frizz. How are you guys liking the hair tutorials? Anything else you’re dying to learn? Love these waves! I can never get mine to look like that ha. I know there are a ton of them out there, but I would love a fishtail braid tutorial! Holy Lady Lovelilocks! So beautiful. 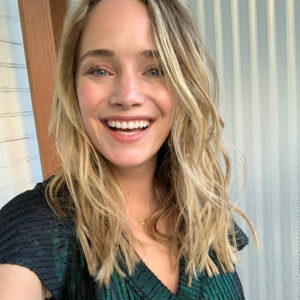 Looking absolutely gorgeous! These beach waves look very flattering on you. 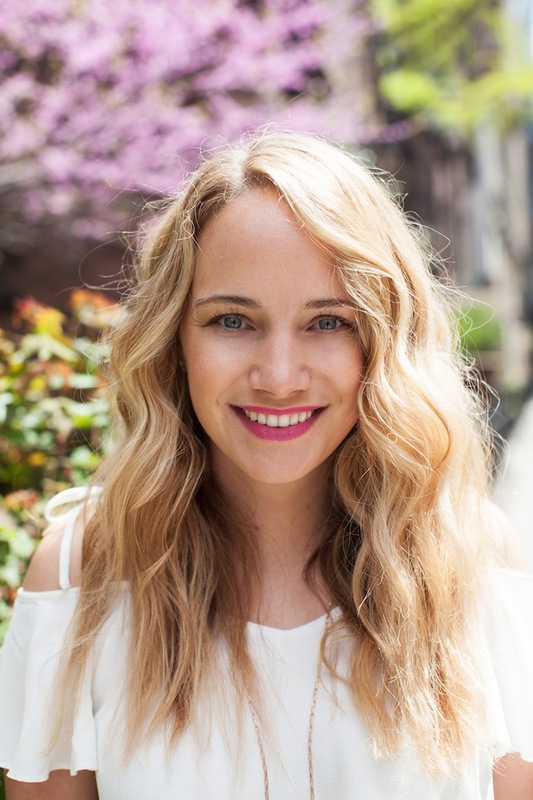 You are gorgeous – I love this natural, easy look! Your hair looks beautiful, thanks for sharing this technique! loooovvveeee this! i recently started drying my hair like that at night and then curling in the am but i need to switch it up and do it like this! Love this tutorial. I need to pick up a beachwaver! Wow, it’s so nice. Love the waves. 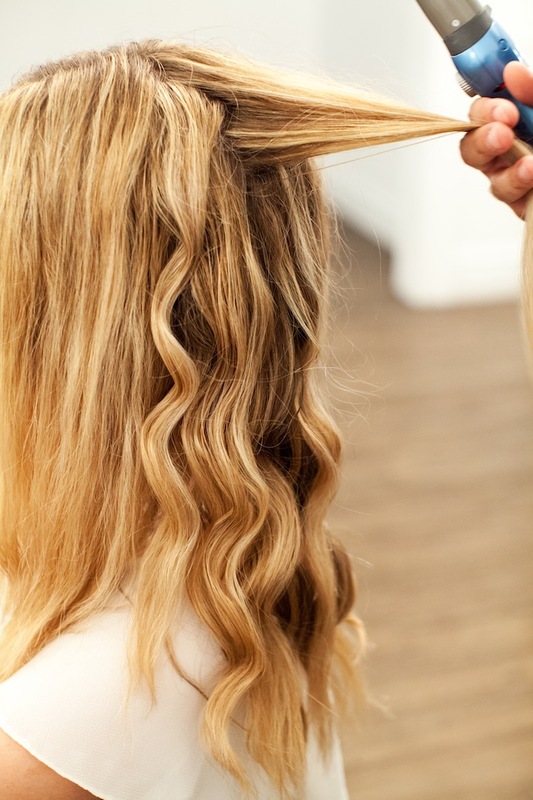 Thank you very much for showing how to make those lovely waves.